“On February 17th 2018, a solo backcountry skier (Skier 1) did not return from an outing to the lift-served backcountry on Big Mountain in the Whitefish Range of Northwest Montana. Search and rescue efforts initiated on the evening of February 17th, but did not find the missing skier until May 12, 2018. Due to the location of the buried skier in a terrain trap adjacent to an avalanche that was identified during early search efforts, it appears that the skier was caught and killed by an avalanche on the afternoon of February 17th. Without witness accounts of the events leading to the accident, and because the evidence of the avalanche was erased by subsequent storms and spring melt, the details of the accident are incomplete. “We have no observations specific to the avalanche that likely buried Skier 1. On February 19th, search efforts identified an avalanche crown (Avalanche A) on the slope above and skier’s right of where Skier 1 was found. It is plausible to assume that the avalanche that caught Skier 1 (Avalanche B) was connected to or a secondary release with similar avalanche characteristics. Avalanche A was a soft slab estimated 14” deep and approximately 100 feet wide that ran 400 vertical feet. It ran on the storm interface (the faceted rain crust), and deposited debris large enough to bury or injure someone. A track entering the slope above the crown indicates it was triggered by a skier. The avalanche is classified as SS-AS-R2-D2-I. Avalanche A occurred on a northeast aspect at 5,860’ on a 38° slope angle. The slope is moderately gladed. A subtle ridge feature divides this slope from the slope where Skier 1 was likely buried by Avalanche B, and these share similar terrain characteristics except that the latter slope funnels into a gulley from a northerly aspect. The vertical relief from the elevation of the hypothesized start zone of Avalanche B to the burial location in the gulley is approximately 250 vertical feet. “On the afternoon of February 17th, 2018, Skier 1 was skiing alone near Kona, a lift accessed backcountry area east of Whitefish Mountain Resort in the Canyon Creek drainage in the Whitefish Range. Around 2 p.m., Skier 1 text messaged his wife that he was finishing his 2nd lap, and would be returning by 3:30 p.m after one more lap. Skier 1 was traveling solo; thus we have no firsthand accounts of the events leading to the accident. Skier 1 was carrying a handheld global positioning system (GPS), which was later recovered and used to track his movements leading up to the accident. Skier 1’s GPS track shows his first two laps on moderately angled terrain in the Kona area, stacking his tracks near to each other and ascending on the same skin track to the Kona ridgeline (Figure 5). On his final lap, he descended a short, steep pitch below Kona Point and traversed a bench to the Beaver Pond. From there, he descended the skier’s right side of a steep gulley that drains towards Canyon Creek. Skier 1’s track enters the steepest part of the terrain halfway down the slope. “Skier 1 was traveling solo; we have no first-hand accounts of the accident. Skier 1 was found without evidence of physical trauma, with one ski attached and the other released but contacting his boot. The rest of his gear was intact and in place. He was face-down oriented facing downhill. His location was approximately 250 vertical feet downhill and in a terrain feature skier’s left of the crown line of Avalanche A (Figure 6). Based on the burial characteristics, it appears that Skier 1 was caught and buried by a relatively small avalanche (Avalanche B). It is unknown whether Avalanche B was connected to Avalanche A or two separate avalanches. We hypothesize that Skier 1 triggered Avalanche A and was skiing away from the avalanche when he was caught by Avalanche B, which may have been a sympathetic or secondary release. C-RAD founder and active member John Reller was contacted in May by Sue Purvis, a dog handler from Colorado who now resides near Whitefish Montana. Sue explained the situation and offered other helpful information to John. John, working with Summit County Sheriff’s office, and the Flathead County’s Sheriff’s Office devised a plan to help. 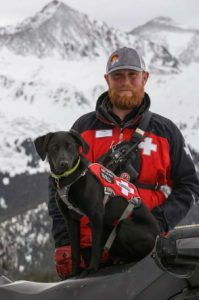 On May 12, three dog teams entered the field again – John Reller and Recco being one of them – and successfully located the missing skier. The Flathead Avalanche Center report highlights relevant information about the massive involvement from the community, the Flathead County Sheriff’s Office and their search and rescue members. 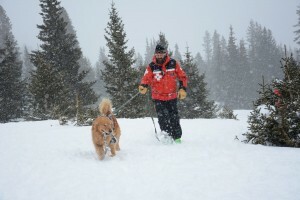 John Reller and K9-Recco are the team mentioned as locating the missing skier.